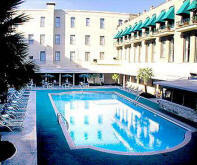 Built in 1859, the Menger Hotel has become an important part of San Antonio's history. 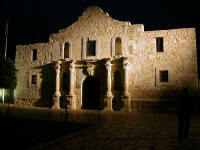 The hotel is located downtown, immediately adjacent to both the Alamo and the River center Mall. AND to top that off, it also comes packing ghosts! 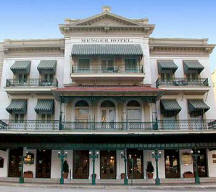 There have been many, many ghostly occurrences at the Menger. Having been built way back in 1859, it has become San Antonio's repository for spirits - with at least 32 different apparitions to chance upon! Some of the ghosts include: a maid named Sallie White, who in 1876 was viciously attacked by her jealous husband in the hotel. She died from her injuries two days later. Guests still report seeing her walk the halls in the oldest wing of the hotel, still in her maid's uniform. In 2003, two employees walking toward the catering office heard heavy footsteps and kicking. When they entered the room, they saw a pair of military boots near the door. "A lady sits knitting in the original lobby of the Menger Hotel. She wears a dated blue dress and a beret with a tassel. Her glasses are small and metal framed. An employee asks "Are you comfortable...may I get you something?" The lady replies "no" in an unfriendly tone and disappears. A guest steps out of his shower and walks into the bedroom of the hotel. 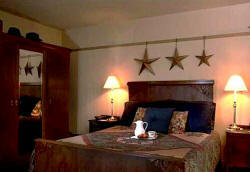 Standing by the bed is the figure of a man clad in a buckskin jacket and gray trousers. To further cloud the issue, this apparition is speaking to someone or something else in the room that cannot be seen. Buckskin asks the question "Are you gonna stay or are you gonna go?" three times." other one, you know - in Fort Worth Texas. 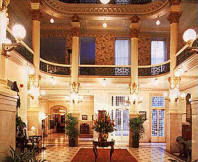 Not quite as big as the White House either - has five guestrooms to offer their guests. But what it lacks in size, it makes up in charm and hospitality, something that the White House doesn't offer. The Texas White House B & B can also offer a hauntingly good time by their resident ghost. 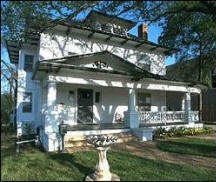 Before it became a bed and breakfast, it was a home built by the Newkirk family in 1910. The Newkirk's raised their family there until the death of Mr. and Mrs. Newkirk in 1967. It was sold and for the next twenty-something years it housed several small businesses, including a restaurant named, "The Texas White House". It was purchased in 1994 by Grover and Jamie McMains and was eventually renovated to become the bed and breakfast it is today. But to the important stuff - ghosts. The resident ghost is believed to be that of Mr. Newkirk, who had died in his home and continues to live or "haunt" his old bedroom, now the Lone Star room(left). The ghost of Mr. Newkirk seems to appreciate the ladies because they are the only ones who have experienced his presence. It usually occurs when a woman is staying alone in the room. Only one woman at a time for this ghost! There have been several accounts of Mr. Newkirk's visit. On multiple occasions, women staying in the room have reported a "strong presence." One person reported that she felt someone getting into bed with her. When she turned around to see, no one was there. Suddenly her cell phone began to beep and would not stop for several seconds, something it never did before. then turned itself on (right). 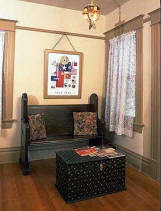 Most recently, a woman returned to the room and felt a presence in the corner. Later that night she felt the same presence again on the other side of the bed. All the accounts report that the ghost have been "friendly."